Klossner: What's in store for Election '08? There has been much talk about the need for a president/administration that understands the role of technology and can implement sound information technology government policy. The lack of an official federal CIO leaves many people thinking the administration has not realized the full potential of IT governmentwide. Some observers are encouraged by both candidates' use of the Internet in the current campaign. They have used the Web to deal directly with misinformation, publicity and fundraising, among other issues. That got me wondering: What might we learn about the candidates' IT philosophy by perusing the stores on their campaign Web sites? The Web sites used for this research are barackobama.com and johnmccain.com. The first thing I noticed, when entering Barack Obama's site, was that visitors are asked to register, providing their name and e-mail address, so that they can be added to the campaign's electronic mailing list. Is this a sign of bureaucracy to come? McCain's site offers this sign-up as an option, not as a gate. Once in the stores, I decided I would start by looking for golf balls. I wanted to know if there was a difference in each campaign's brand preference, since golf balls are something that candidates can always move to their business supporters. 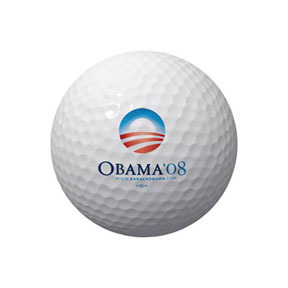 For the record, Barack Obama's store offers three Top Flite XL balls for $15. The McCain site doesn't offer golf balls, but it does offer a combination key chain/ball marker/divot repairer, so it's not as if they're insensitive to the needs of the golfer. McCain, who must figure that his supporters have enough golf balls, clearly could spin this as another populist attempt by Obama to flood the golf courses of America with new golfers. I was surprised to discover that neither site offered flag lapel pins for sale, considering the heightened interest in this accessory during recent months of the campaign. I would have guessed that both campaigns would have avoided the appearance of unpatriotic-ness. But other lapel pins are available. Obama offers four lapel pins -- three with various campaign slogans, and one available in the shape of any state and emblazoned with "Obama '08." All pins cost $10 each. McCain's site offers six lapel pins, including two state-shaped pins, one with "McCain '08" and one with the good senator's photo on the shape of your state. (I didn't check to see if that was a problem for the Hawaiian pin.) The state pins go for $15.00 each. McCain's site also offered a "Sportsmen for McCain" pin for $25.00, (no sign of a "Golfers for McCain" pin, so the jury is still out on his support amongst golfers), two varieties of McCain campaign pins for $150 each (although they did offer two for $100.00 each), and what was described as a nautical pin, featuring something being said in flag signals (which I don't read, maybe it's the secret URL for golf balls), for $200.00. McCain's store offers 21 varieties of buttons. 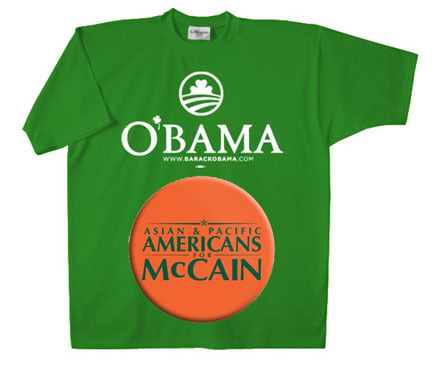 These include three varieties of St. Patrick or "Irish for McCain" buttons. The buttons on McCain's site range from $5-$7 each, with a $10.00 button available to those who want one with their name printed on it. Obama's site offers 19 buttons, with the majority priced at $3.00 each or two for $5.00, with one, featuring the senator's face, priced at $4.00. Obama also offers a "Republicans for Obama" and "Independents for Obama" button. McCain has no "Democrats for McCain" button. The Irish theme is interesting. 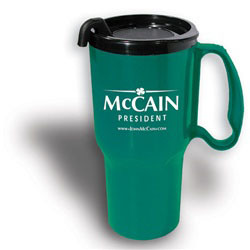 McCain's site store offers three buttons, four short-sleeved t-shirts, one hat and a coffee travel mug with Irish or St. Patrick themes. (Note to fact-checker: Isn't McCain a Scottish name?) McCain also has an entire category called "Go Green." True, it's a list of environmentally-friendly products, but readers understandably might be confused. Obama offers one short-sleeved St Patrick's t-shirt, listed under something called "gear for less" -- the online remainders' bin. Wait a minute: Under the "Parents for McCain" link, I stumbled on an item called the "Father's Day McCain Golf Pack!" There is no description for this item, which sells for $50, but the photo shows two bags of some sort -- or is that one bag and a Shriner's hat? -- with McCain's name embroidered on them, the divot fixer/ball marker/key chain ensemble and four BALLS! 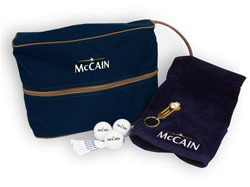 I guess the McCain camp counts on their golfers to be dads, as there is no "Mother's Day McCain Golf Pack." Senator Obama's site offers two styles of hat for $15 each. No visors. Senator McCain's site offers 19 styles of hat and visor, with hats going for $25.00 each and visors $15.00. Does this show a greater sensitivity to global warming issues on McCain's part? Note: Neither candidate offers merchandise for "Golfers for XXXX." 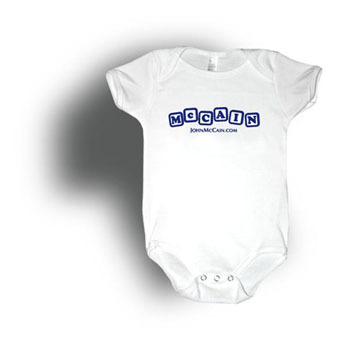 McCain offers two varieties of baby onesies, each priced at $15. Obama offers one style of onesie for $18. Obama's site lists four DVDs, including a collection of speeches, a history of his campaign and a copy of his speech on race, priced at $12.00 each or five for $50.00. No mention of his books anywhere. Is this a show of sympathy to online book retailers by not cutting into their business? I didn't see any "Online Retailers for Obama" merchandise anywhere. None of the other books he did with Salter appear on this Web site. There seems to be a united effort by the candidates not to lose the Amazon.com vote. 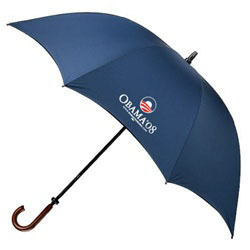 Obama offers an umbrella for $45.00 and a windshield shade for $18.00. This could be seen as playing the environmental issues both ways. Either that, or living with Chicago weather. McCain offers a filtered water bottle for $10 and the previously mentioned "Go Green" product section. Taken with the array of hats, it could be argued that the senator's years in Arizona have prepared him to address the global warming needs for the rest of us.